We seem to get more into Halloween with each passing year, so maybe by the time Gareth starts to lose interest Ryan and I will be super-crazy about it! Or not. Gareth's first Halloween we didn't dress him up at all. As I recall, both Gareth and I had colds and were pretty miserable. The only reason he had a costume for his second Halloween was because we inherited some hand-me-downs and there happened to be a red rain coat with black trim in the bag. It wasn't too much trouble, even for me, to run out and buy a cheap fireman's hat. The only reason Gareth had a costume last year was because my friend took me to Joann's with her when they had a 99 cent pattern sale. And because she let me use her coupons for the fabric and borrow her sewing machine. And because my mom spent a good portion of every day on the phone with me helping me figure out how to not totally screw the costume up. That fireman year was when Ryan had the idea for this year. We decided to wait a couple of years until Gareth was old enough to handle face make-up, but young enough still to let us totally decide his costume for him. Gareth was bouncing off the walls for some reason all morning long, so when it was time to put on his make-up we sent him into the bathroom alone with Ryan, figuring that too many people would work him up too much. Ryan had put quite a lot of time in watching various videos of Joker make-up and staring at pictures of the Joker (Heath Ledger version) and had a good idea of what he wanted to do. We weren't able to replicate the scarring, unfortunately, because the stuff that does that would have taken too long and tried everyone's patience a bit much. But I was very impressed with how quickly he put the make-up on. Gareth was more cooperative than we expected and was quite excited to see his face in the mirror. It was amusing that just about everyone we saw knew who Gareth was but Gareth had no idea. If asked he'd just say, "I'm Gareth" or "I'm pretty scary". The one exception to recognizing him was a lady who thought he was Beetlejuice. There's a definite high that comes from having people appreciate the work that went into your kid's costume. Gareth definitely caught most people by surprise as they seemed to be expecting another cute little bear or lion or princess or whatever most store-bought little kid costumes are these days. One guy gave Gareth three handfuls of candy he loved the costume so much. At an older couple's house the husband asked to take a picture - Gareth was the first he'd liked well enough to take a picture of that night. (Granted, we were out pretty early - it was about 6:30 - so there was plenty of time for him to come across a few more impressive costumes.) And just about anyone is impressed when they discover that the costume is homemade (I got several compliments last year because of that). Oh, yeah, and we actually did jack-o-lanterns this year as well. Which Gareth thought were totally awesome. But somehow the pictures of those didn't make it off the camera. Anyway, I'm glad Gareth had fun with it all, because I'm pretty sure the rest of us adults had fun. Too bad he might want to have some input next year or else we could start planning now! 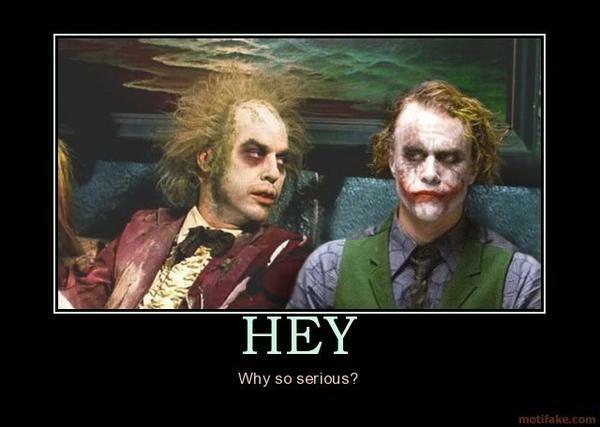 Yeah, he is one scary Joker!! Did you guys dress up at all? Us? Dress up? Uh, no. We aren't that into it yet. I ran out of costume ideas when I was in 4th or 5th grade. Maybe if we're feeling incredibly inspired and ambitious one year it'll happen, but I'm kinda doubting it. I loved this post, Erin! What a fun read! And what a cute little, scary little Joker! I can't believe how big Gareth is getting to be! I'm 90% impressed and 10% creeped out that you could make your cute little boy so scary! But that is seriously one well worked Halloween costume! Gareth better have gotten a TON of candy for all your efforts! We were aiming for at least 20% creeped out, but I suppose we'll take what we can get. It's really, REALLY too bad we don't live next door anymore. I made a bat costume for Sylvia that I could have easily worked into a Batman costume. Trick-or-treating with you guys would have been awesome! Awesome costume. Gareth looks pretty creepy.